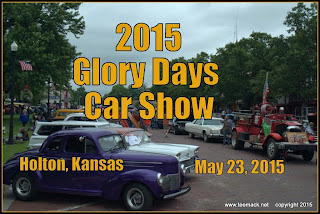 The Annual Glory Days Car Show was held over Memorial weekend at the town square of Holton, Kansas. Approximately 100 vehicles were on display on May 23,2014. The annual event is sponsored by the Holton, Kansas/Jefferson County Chamber of Commerce. Along with a parade of past graduates of Holton High School, there were also many local venders displaying there goods. The weather for the event was cloudy most of the day with a little sunshine from time to time. Click here to view photos of the event.